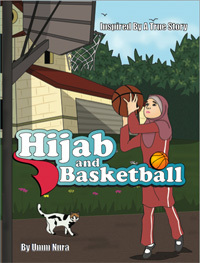 Hijab and Basketball is the story of Amina, a young girl who is moving to a new school and is anxious about how her people will perceive her hijab. On arriving Amina makes friends and joins the basketball team, but she also finds she is teased about her headscarf. Finding courage in the story of Nusaybah bint Ka’ab, who walked into battle in the early days of Islam, Amina faces challenges when she is given the opportunity to play in a basketball tournament because of her head scarf. My daughter previously read Jannah Jewels by the same author and enjoyed it, so I was keen to take a look at this book. The book addressed what felt like common and realistic complaints from a young woman: her anxieties about starting at a new school, making new friends and having to explain the hijab to other students. I liked that the main character was positive and strong – she is clear on why she wears the hijab and can explain to others, she is athletic, being good at basketball and she is able to stand up for herself when bullied, including when the bullies make fun of her ablutions and prayers. The book also touches on the complexity of bullying amongst girls – the way friends behave differently in front of bullies or the way that bullies might have their own difficulties or sadness to contend with. The book is also considerate of other faiths. One of Amina’s friends is a Christian and they compare some of the beliefs they have. Amina’s sympathetic and kind basketball coach is a Sikh. I am all for teaching our children to respect other faiths and to be considerate of other people’s ways of thinking. My 9 year old daughter enjoyed reading this book and I liked how she reacted at the prejudice Amina faces during the basketball tournament – with indignation. Surprisingly, my boys (7 and 5) also liked the book and my older son also commented on the unfairness of what happens during the tournament. The book does not end with a clear-cut happy ending, but it certainly leaves its young reader in a place where they will have questions about what happens. A well written, easy to read book, with good role models in the shape of Amina, her coach and her mother amongst others which should give children plenty to think about. Salaam sister, would you be able to put a search box on your blog? I often want to read an old post but have to dig through lots of pages to find it using the category tags. Im a mother to a toddler and new to London and love your blog. Thank you for stopping by the blog and for your kind comments. I have added a search box on the right side bar. Hope readers find this useful. Assalaamu alaikum where can I buy this book in the UK?